I cry every year when I watch the opening ceremonies at Wrigley Field. The tradition and the romance and the goodwill ... the were all on display, and they are all what being a Cub fan is about. This evening, when the announcer introduced "your 2016 Chicago Cubs," the last name he called Kyle Schwarber. The crowd went wild. He ambled out on crutches. I turned on the water works. For this charming 23-year-old kid, this hitmaker, this hero from last year is out for the season. In a heartbreaking turn of events, he took a tumble in the outfield during Game 3, while the boys were still on the road. 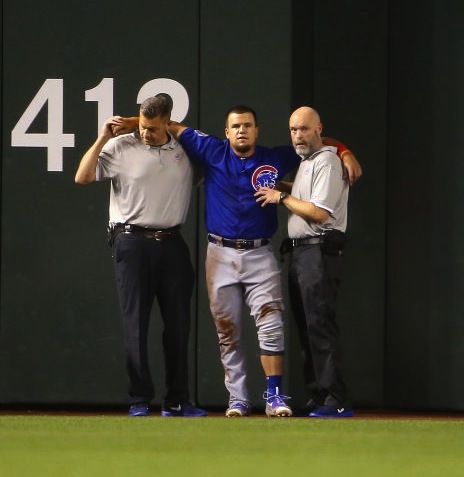 Schwarber tore the ligaments in his knee. He played two games, and now he's done. So unfair. I was touched to see the Wrigleyville faithful shower the kid with love. We're good people that way. We're loyal and we really love our guys. Then three of the Cubs Hall of Famers threw out the first pitch. The heroes of my youth -- Fergie Jenkins and Sweet Swingin' Billy Williams -- were joined by my grandmother's all-time favorite Cub, Ryne Sandberg. Sniffle, sniffle, sniffle. If my own personal hall of famer, my beloved Greg Maddux, had joined them, I would have simply died of completion. But he's working for the Dodgers now. Which is OK. Doesn't matter. I'll always love him best.